POWER OF WATER: WATER IS ONE OF TWO ESSENTIAL RESOURCES. WATER IS ONE OF TWO ESSENTIAL RESOURCES. On our farm, we are constantly managing water, so it may provide life for our animals, people, microbes, reptiles, amphibians, grasses, and trees. 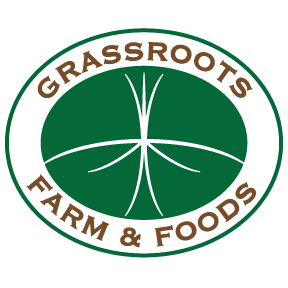 All of these combine to create a resilient ecosystem, in which to raise grassfed foods for delivery to you. We must supply over 500 head of livestock and 3 families with water every day of the year. Nothing commands our attention more than an interrupted supply of water. Three different wells and one spring work to satisfy demand, all driven by electric pumps. When electricity goes out, water stops flowing, and heads jerk in response. Pumps also malfunction and springs and wells expire. In the past three years, one ancient spring and one newly-drilled well have gone dry, keeping us guessing, as to why water is not flowing. Running out of water puts a strain on marital relations, especially when it happens in the middle of a shower or when the in-laws are in-residence. One Easter weekend, Susan's mother was visiting, and the spring feeding the house decided to stop providing. Fortunately, she grew up in the Depression, and adapted gamely to "doing without". Shortly thereafter, we drilled a new well, which provides bountiful supply, but carries silt that needs to be filtered. What is worse is when 100 dairy cows need to be milked and the water supply ceases to function. One or two women pointing their finger at one is bad enough, but if there are 100, one is in real trouble! When supply of water for the dairy ceases, we have to diagnose where the problem lies, among a maze of underground pipes and electric wires. That takes some thinking, but we have resolved the quandaries thus far. Dairy cows drink a lot of water - up to 20 gallons per head per day. Milk pipelines and the dairy holding yard are washed as well after every milking, commanding total use of about 3,000 - 4,000 gallons per day for cows and dairy facility. Lactating beef cows require up to 10 gallons per head per day, and lactating ewes around 5 gallons. Our meat operation thus requires another 2,000 gallons per day. We use a lot of water in our kitchen, for cleaning pots and pans. Between three houses and an enlarged kitchen, we are probably using another 1,000 gallons per day. Total water consumption on our farm, therefore, approaches 7,000 gallons per day. All of this water is delivered by pumps at the bottom of wells and springs, through 32,000 feet of 2-inch buried PVC, and pushed by pressure tanks. When flow of water is interrupted, everybody takes notice. Smooth production of anything requires back-up systems. 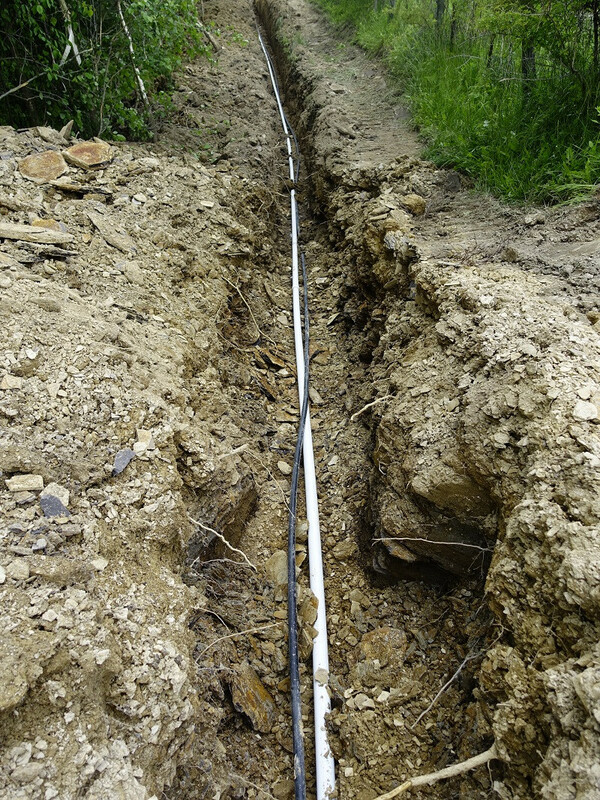 We have finally decided to back-up our wells and springs with county water, so this past month we installed another 1400 feet of water-line connected to the county supply, as pictured below. The benefit of county water is it is chlorinated, which health inspectors require for commercial kitchens. It also provides its own pressure, is not reliant on the local grid, and supply is not limited. The liability is a monthly fee and the fact that it is chlorinated. Neither livestock nor humans like it as well. But it does provide insurance. We do not water livestock in streams except in emergency or in select times in the winter. We don't want cows loitering in and degrading this invaluable resource. Plus we'd rather have the manure on the land. In this trench, you will note two waterlines - a white 2-inch PVC and a black one-inch polyethylene. The two-inch is bringing county water into the basement of the house. The one-inch is taking spring water out to new hydrants for livestock. We could have fed the new hydrants with county water, but health inspectors for commercial kitchens will not approve of possible contamination from backflow from livestock tanks. We are using the same trench for two delivery systems - one for livestock and one for house and kitchen. This picture shows having to dig through a section of shale. We poured sand into that section to protect the pipe from the sharp edges once the trench is filled. 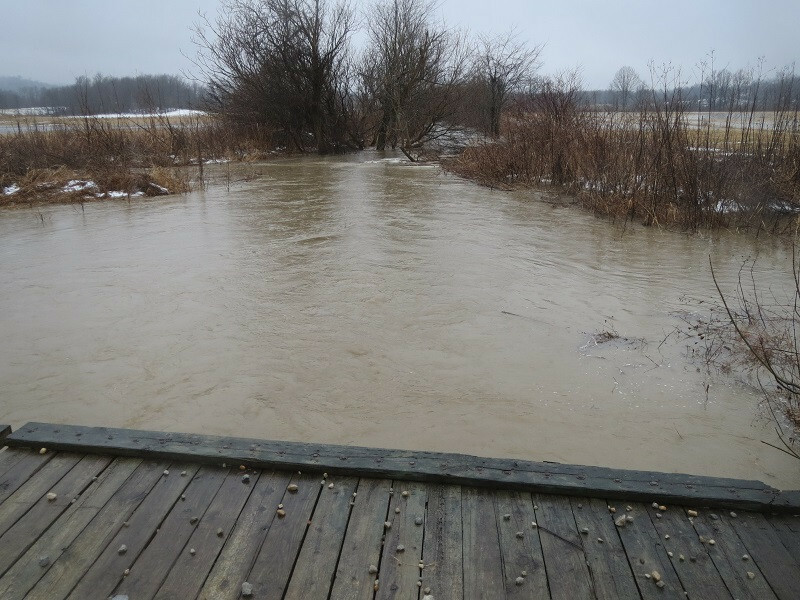 Another aspect of managing water is flooding. We typically experience flooding of our bottoms once a year and ocassionally three or four times. We have to be vigilant livestock are not caught in floods and we need to plan for high ground to move them onto plus stored-feed to offer, if necessary. 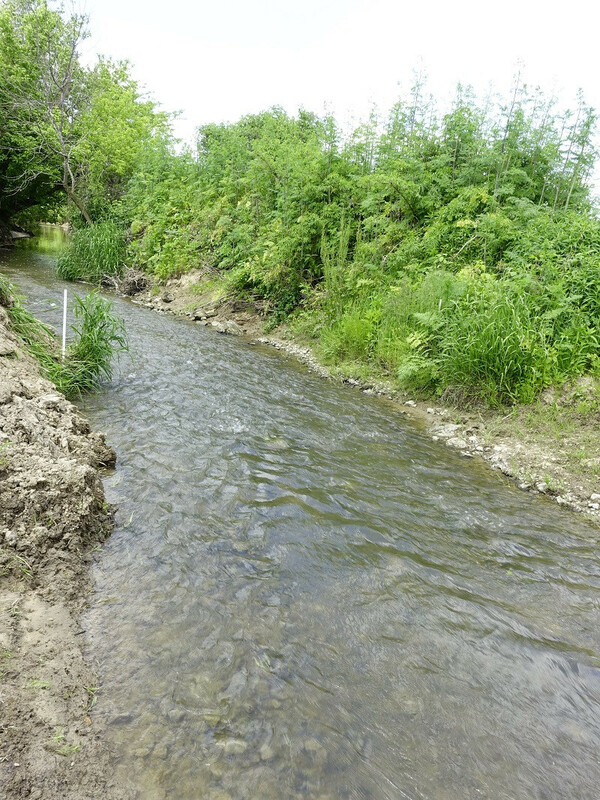 The picture on the left below is of the same stream as the first picture, only taken in March 2015. The black disc in the middle of the second is a 300-gallon watering tub stranded in floodwaters. We also have in our bottom lands a maze of 4-inch perforated tile-lines, buried three feet deep, on 50-ft centers, which have been installed over the past 50 years, for the purpose of draining residual water out of fields. 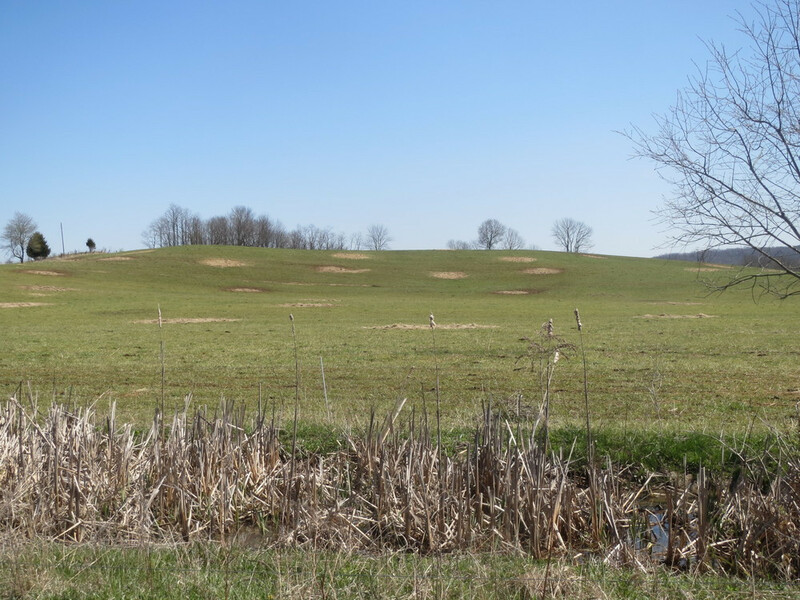 This keeps our hydric soils, underlain with a seam of clay, from resorting to wetlands. The picture below shows an outlet for 30 acres of tile lines. The big concern is drought. We have been fortunate not to experienced the drought the West has known, but our day will come, especially with the pressing advent of climate change. We had a very dry summer in 2012, and want to be prepared when such weather returns. We would like to build several lakes with which to hydrate subsoil and serve select irrigation, but that is a capital-intensive solution. The best strategy by which to supply water during a drought is to build organic matter of soil. 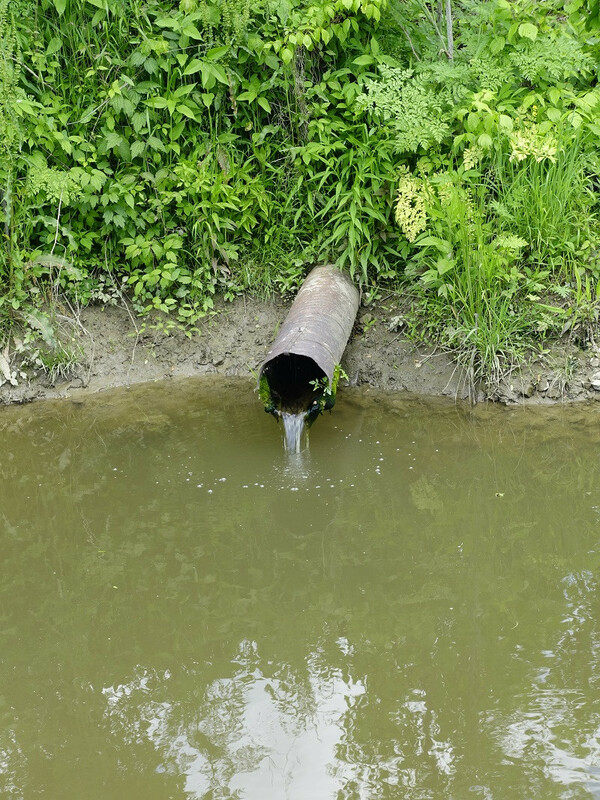 Every 1% of organic matter holds more than 20,000 gallons of water per acre. This equates to about 3/4 of an inch of rain. If organic matter is 5%, then the soil provides a reservoir of water equating to 3/4 of an inch per week for 5 weeks. That is sufficient moisture to successfully come through a drought. We are increasing organic matter on our farm at a rate of about 1/3% per acre per year. Our average organic matter started at 2%, is now close to 4%, and we are aiming for 8. As stock numbers grow, the rate of increase should increase as well, as long we employ high-density, low-duration principles of grazing. The concluding comment about the power of water to sustain life is we are building a swimming pool. This is an investment in quality of life, which we have long considered, and increasingly value, as we age. 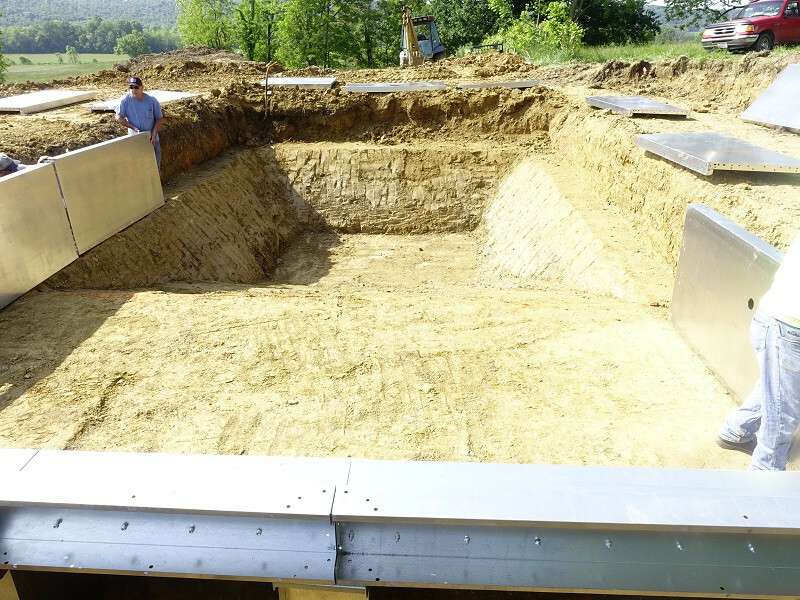 The pool will be heated and have a cover to provide resistance-free, aerobic exercise seven or eight months a year. It is not for luxuriating next to, but for maintaining health and well-being within a busy schedule. 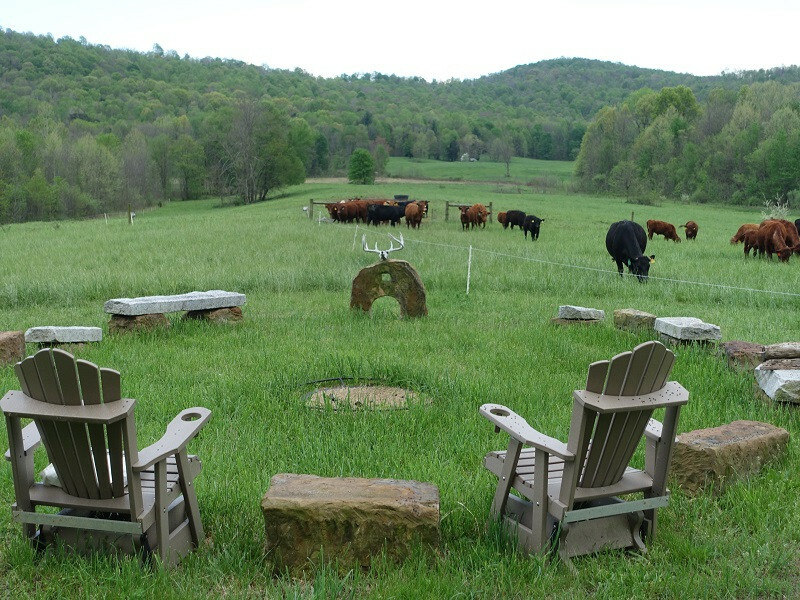 Allan Savory encourages developing plans for items like pools, as he explains a landscape should support the life envisioned. And besides, a pool returns one to the amniotic state, where all has been well for several million years. So, it feels like a prudent decision. Memorial Day is this weekend, so if you need anything special. let us know as soon as possible. The above meal was taken on Derby Day, which is considered by my Kentucky wife to be the most important holiday of the year. 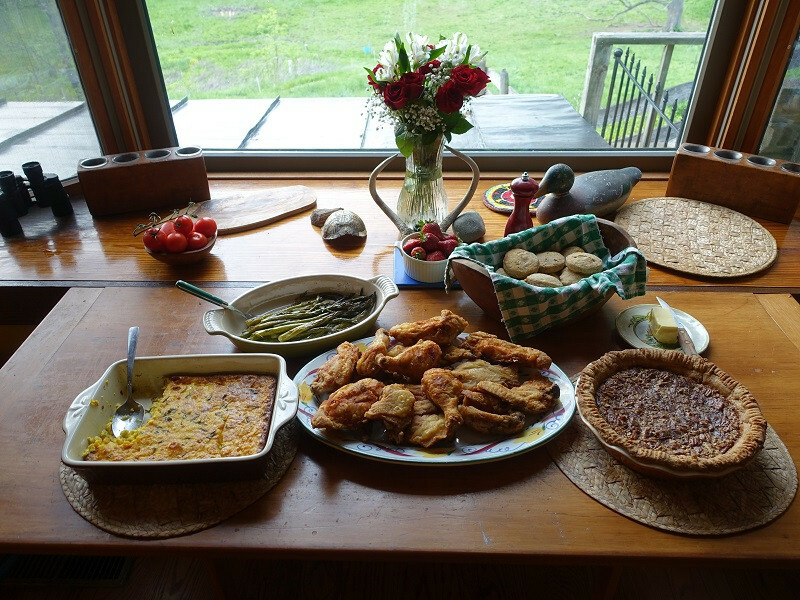 In its honor, a repast appeared of: Kentucky fried chicken, corn pudding, asparagus, biscuits, and Derby Pie - with pecans, corn syrup, chocolate, and bourbon; enough richness to make your eyes roll backwards. What is not pictured is the Kentucky Lemonade, with which the two most exciting minutes in sports were watched. The other essential resource is the sun... But today we express gratitude for the power of water to enhance life. ASTRAL INTERVENTION: MERCURY IS "RETROGRADE"! WHILE THIS MAY BE EVIDENT TO YOU, IT ESCAPED MY NOTICE, UNTIL EMPHATICALLY POINTED OUT BY MY BETTER-HALF. 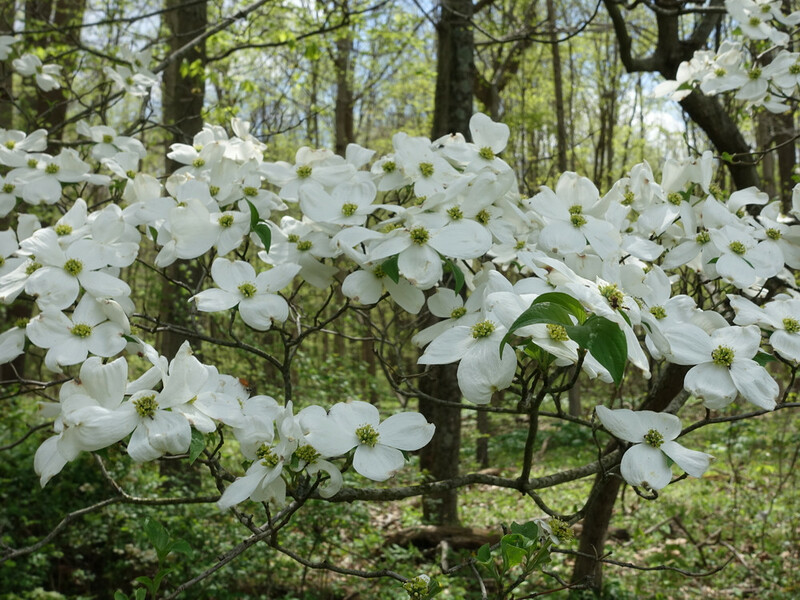 TRAGEDY & HOPE IN PIKE COUNTY: INTENSE TRAGEDY STRUCK PIKE COUNTY THIS PAST THURSDAY NIGHT, 20 MILES FROM OUR DOORSTEP. OPENING DAY: Opening Day at the farm is almost as important as it is on the Riverfront.